Seamlessly convert emails into support tickets with Trakdesk advanced email parsing. For example; If customers often send support requests to your email account, you can forward the email to your Trakdesk support address which will automatically create a support ticket in your helpdesk and set the original sender as the ticket requester. It will also send out automatic notifications to customers letting them know that their request for support has been received. Managing your email notifications. You can use the Trakdesk elastic email address to convert emails into support tickets, example (support@yourdomain.trakdesk.com). With this option, you do not need to setup email forwarding. By default, any email sent to this address will automatically be converted into a support ticket in your helpdesk. If you are like some businesses, you may want to preserve your brand and use your own support email address to convert emails into support tickets, example (support@yourcompany.com). With this option, you will have to setup email forwarding on your email server to forward emails from your support email address (support@yourcompany.com) to your Trakdesk elastic email address (support@yourdomain.trakdesk.com) so any email sent to your support email address will automatically be converted into a support ticket in your helpdesk. 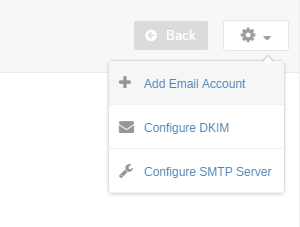 Configuring DKIM for your support email addresses. Forwarding emails on your email server preserves the email header information so that the email appears to be from the original requester, not from you. This will create a support ticket in your helpdesk with the original sender as the ticket requester. Forwarding emails from your email client inbox such as; Outlook, Gmail, Yahoo etc means that the sender becomes you, not the original sender. This will create a support ticket in your hellpdesk with you as the ticket requester. Enabling the Original requester option will instruct your helpdesk to retrieve the original sender of the email from the email body, for emails that has been forwarded from your inbox to your support email address and set it as the original sender. At the Top Right of the page, click on the drop down menu and select Add Email Account. 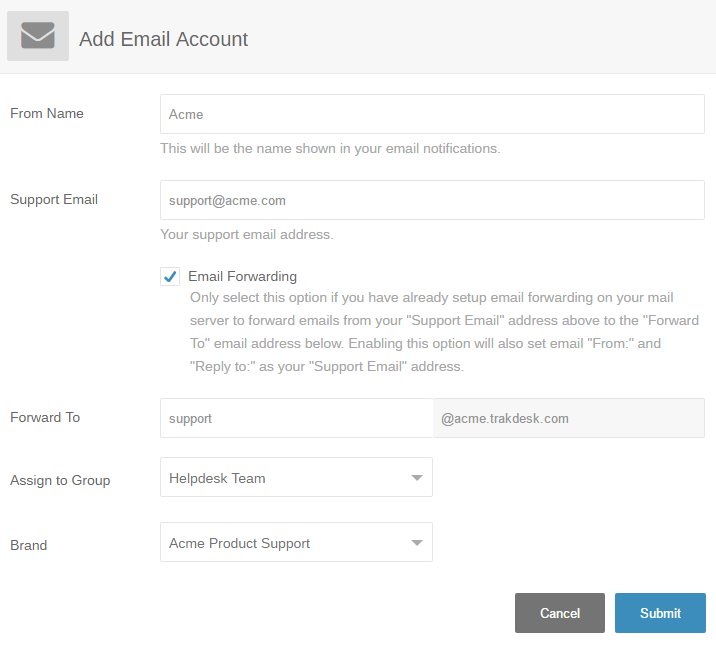 On the new email account page, enter a unique name and support email address, then enter an alias for your Trakdesk elastic email account and assign the account to a group. You can also assign the email account to a specific brand if you have multiple brands and products setup, and enable Email Forwarding to use your own support email address to send and receive emails from your helpdesk instead of the Trakdesk's elastic email address. Note: Enabling the Email Forwarding option will require you to setup proper email forwarding on your email server as mentioned earlier. Once you have filled out all the required information, click on the Submit button. Once the account has been created, an email account verification email will be sent to the Support Email address that you have entered. Click on the link in the email to complete the account verification process. Note: The email account must be verified before you can send or receive emails from the account.